1The practice of taking action to preserve or improve one’s own health. The definition of self-care is revolved around both physical health and mental health. And while taking care of your physical health is extremely important (trust me I know!) we are more in tune with our physical health. Which unfortunately means that sometimes your Mental Health can be forgotten or seem less important. But it can be even more important than your physical health as your mental health can affect both mental and your physical health. So I thought I would share with you guys some simple tips, that I have been implementing in my life recently. To help look after my overall wellbeing. And hopefully, help you do the same! Pick out a special card or postcard that you love, use this to write a letter to yourself. It can be to your future self, past self or even to your present self. Fill it with whatever advice you would love to hear or what you wish someone would say in a letter to you. Keep your card or postcard somewhere safe so you can go back and read it whenever you feel like you need a bit of inspiration. I will not be pressured into anything I’m not comfortable with, like drinking alcohol. Being aware of what I’m putting in my body, like food, medication etc. As well as on my body, so I only use natural products instead of chemical-filled ones. Personal policies are especially important for teenagers, as its so easy for us to be pressured into things we may not necessarily want to do. A vision board is a collage of pictures, words and quotes that represent your inspiration and what your dreams are for your life. It can be used to help clarify what your purpose is or help you work towards your goals. As it serves as a constant reminder of what you want to achieve. 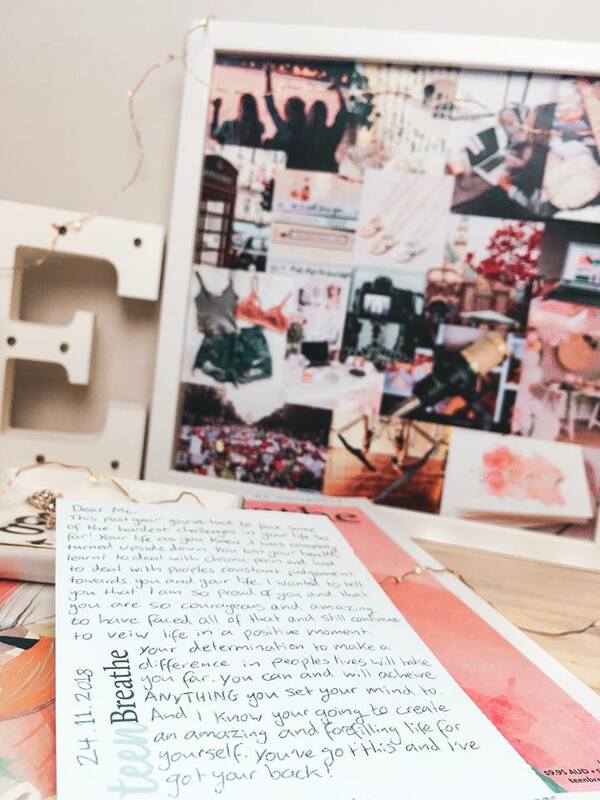 The best part about vision boards or dream boards is there are no rules! All you need is a base, you could use a cork board, a price of cardboard or a frame like me! Then use either magazine you don’t mind cutting up or you can print off photos off the internet. Find a quiet spot, play some of your favourite music, put your phone on silent and let your creativity flow. Chose photos and or words that resonate with you and bring you motivation. Use glue or thumbtacks to stick your photos and words down. Finally put it up somewhere you will see it every day. I like to create a new dream board every year or 6 months as my life adapts so does my goals. Allow yourself 30 minutes each day to do whatever you want. Just make sure it’s something that you enjoy/find relaxing. For me, that’s reading a book, watching some of a TV show on Netflix or catching up on my favourite bloggers posts. The rule is that you aren’t allowed to feel guilty or focus on all the things you should be doing instead. This time is just for you to chill out and unwind from the day. I know it can be easy to get wrapped up in life and feel as though you have no time for yourself. Let alone 30 minutes! That’s why it’s all about starting off small, make it a goal to incorporate one tip into your daily life. And then slowly incorporate more and don’t beat yourself up if you miss a day. As this is supposed to be fun, not feel like a chore! thanks so much, Elina! you’ve really helped me in self care! I’m a new subscriber and I don’t regret subscribing to you.